The Versailles Ag Sales team consisted of (l-r) Jacob Wuebker, Dalton Hesson, Cory Timmerman and Laura Wuebker. 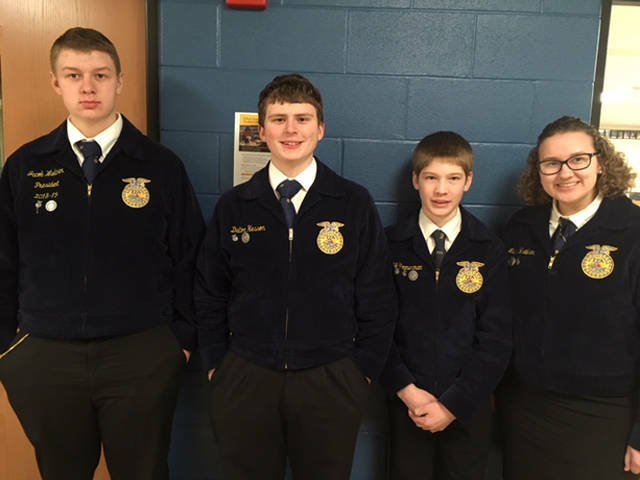 BROOKVILLE – Four Versailles FFA members participated in the District 5 Ag Sales Competition on Feb. 5 at Brookville High School. Members who participated included Jacob Wuebker, Laura Wuebker, Cory Timmerman and Dalton Hesson. As part of the competition members were to sell a product and give a 10-15 minute presentation about their product. Everyone sold Pearl Valley Cheese, and Pearl Valley Cheese provided the team with cheese to sell and promotional material. Participants also took a test on ag sales and marketing and participated in a customer relations practicum related to the plant industry. Ryan Langenkamp, Deanna Hesson and Dallas Hess helped coach the team. The Versailles team placed second overall in the district out of 13 teams and is headed to the state competition. As individuals, Jacob Wuebker placed first overall, and Laura Wuebker placed third overall.